for the Advent Swap I participated in. some images and her blue dress seems to feature a lot! Christmas presents blocking the door! Oooh-la-la - moving swiftly on! see, there's that blue dress again - lol. 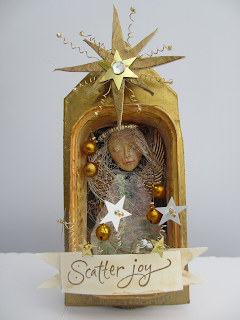 my partner for the Advent swap. Are these gorgeous, or are these gorgeous! red and white heart is filled with it and I love lavender! Here now are some of the presents I made for Victoria. 'Sewing Room' dress maker's die. some pink ribbon around it. as described by Leandra on the Paperartsy's blog. 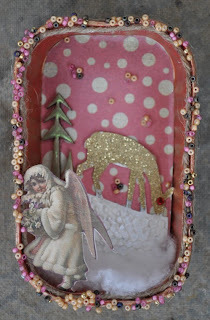 a Vintaj DecoEmboss by Sizzix. There is a small crocheted flower on there too. Just three more days to go!! rose stud earrings and the crocheted jar cover. Some of the gifts I handmade for Victoria are below. and the square is a little tile. and I chose two of Victoria's favourite colours - pink and green. the 'Word Play Alphabet' Tim Holtz/Sizzix Bigz die. .. also made a pretty box for it to go in. postcards Sherry enclosed from her home town. so you can't see the cute little buttons sewn on the flap. still several to buy - and I haven't posted my UK cards yet! to come and see you soon.